The Holy Father began by reminding the faithful in St. Peter’s Square that everything we have, even our very existence, is a gift from God. He said there is no space in the Church for “self-made men”, because we are all indebted to God. But, he said, we often leave out the words “thank you” when we pray, as if forgetting that we owe all to God who forgives us when we go astray. Pope Francis said Jesus intentionally added a second part to the petition “Forgive us our trespasses”, which relates our being forgiven by God to our forgiveness of others. “Those who have received so much must learn to give as much, without holding some back for themselves,” he said. Pope Francis then told a story of a priest he knew who went to hear the Confession of a lady who was on her deathbed. The priest, he said, asked her if she repented of all her sins. Yes was her answer. So, Pope Francis concluded, this Easter week is an opportunity to offer others the most precious gift we have received: forgiveness. He said the morning of Easter represents “the perennial youth of the Church and of humanity as a whole”. Jesus, he added, does not abandon those who face hardship and sorrow, and he named the many parts of the world that are witnessing various forms of conflict. Pope Francis said Easter keeps our eyes focused on the Middle East, praying that Christians “patiently persevere in their witness to the Risen Lord”. He said the world risks forgetting the people of Syria, who he said are victims of an ongoing conflict. 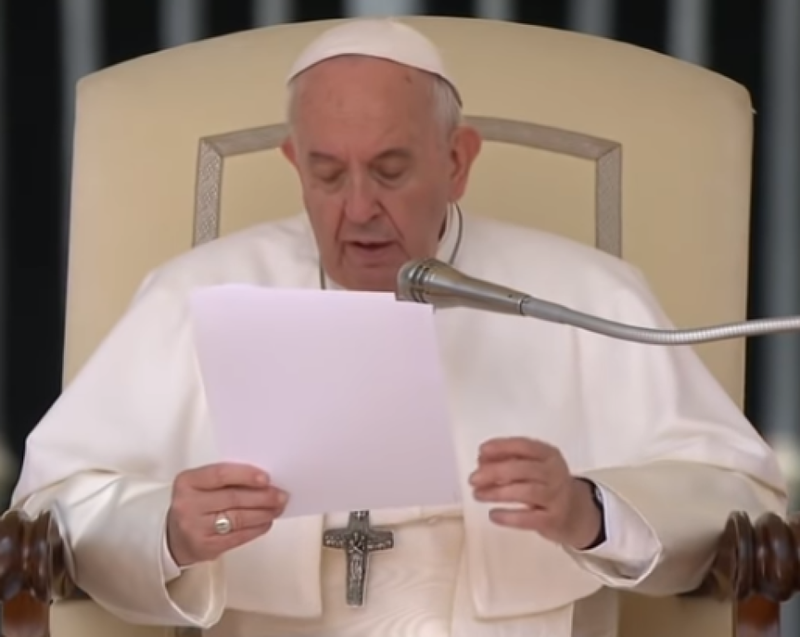 The Pope also prayed that the light of Easter illuminate all government leaders and peoples in the region, “beginning with the Israelis and Palestinians,” and lead them to pursue a future of peace and stability. Pope Francis then turned to the African continent, first calling for the end to bloodshed in Libya, “where defenseless people are once more dying in recent weeks and many families have been forced to abandon their homes”. He urged those involved to choose dialogue over force. 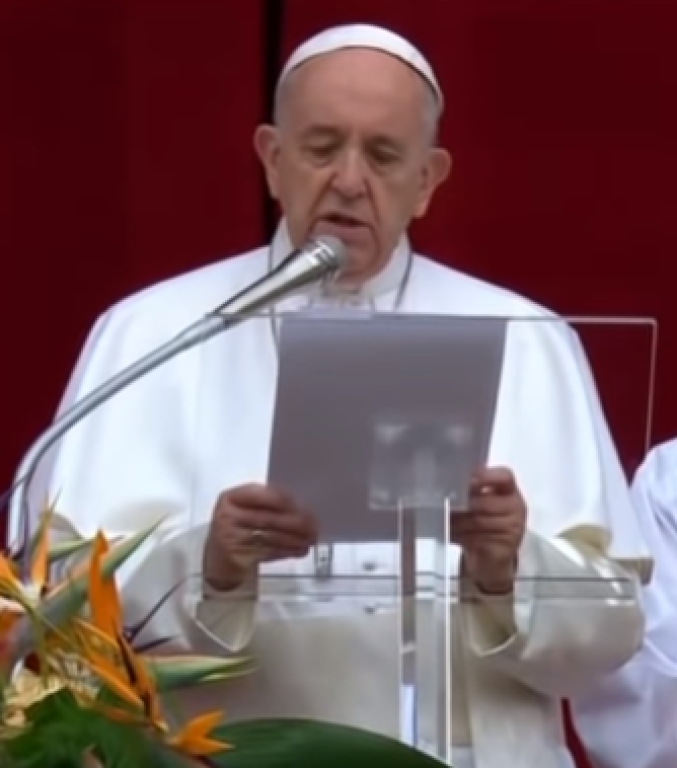 The Pope said parts of the continent are “rife with social tensions, conflicts and at times violent forms of extremism that leave in their wake insecurity, destruction and death.” He specifically mentioned Burkina Faso, Mali, Niger, Nigeria and Cameroon. Sudan, he said, is experiencing “a moment of political uncertainty”, voicing his hope that all parties will be heard. The Holy Father spoke briefly about the continuing conflict in eastern Ukraine. He prayed that the Lord “encourage initiatives of humanitarian aid” and efforts towards a lasting peace. Turning his thoughts to the Americas, Pope Francis prayed that the joy of the resurrection fill the hearts of those experiencing difficult political and economic situations. The Pope also prayed for a “peaceful negotiated solution” to the political crisis in Nicaragua. Finally, Pope Francis asked the Lord to make us “builders of bridges, not walls” and to end “the roar of arms,” both in conflict zones and within cities.